There has been a surge in violence in the past sixteen hours. 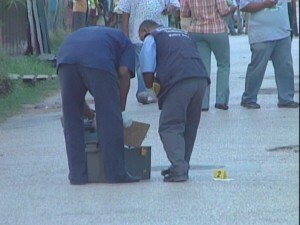 Two men were murdered overnight…but this evening, a sustained shootout, purportedly between members of rival gangs in the Lake Independence area, has resulted in the hospitalization of two Belize City youths. Just after five p.m., a barrage of as many as twenty shots was reportedly let loose near the corners of Flamboyant and Vernon streets. It is believed that elements of the PIV gang came under fire from their adversaries in the area. Witnesses say that while attempting to flee the scene, one of the alleged gunmen, a minor, was shot in the arm by an off-duty police officer, who restrained him allowing the intended targets to have their way with him. The minor, News Five understands, was severely beaten by the pair before being transported to the hospital by ambulance. A second individual was also shot in the leg during the violent exchange. A swarm of officers would later converge on the scene of the incident, where technicians recovered several expended shells. This is totally out of control now and this pm is still mute on crime he as a big mouth but when it comes to all the murders going on he is dumb a nd mute enough is enough corruption rampant murders day and night we need a new pm and gov now lock up all this gov. It’s hard to feel sorry for the shooter who claims he was roughed up by the people he tried to kill! In some Mexican villages, they would have just lit him on fire and been done with it. Good job for the officers to catch the shooters so quickly, let’s hope DPP can figure out how to win convictions. It’s so ironic how Caleb could have got the court to hear his case and yet this incompetent PM can’t find a way to request an ammendment to the constitution to address the rampant crime situation that is plaguing the Jewel. The destructive impulse of the UDP… fist they destroy a half a million dollars in rosewood to keep the attention off the corruption of Deputy PM Vega (who is dealing with illegal rosewood). They then make every effort to destroy the integrity of the constitution (Dean Barrow’s stupid amendments – read justice Legall’s judgments). They then destroy – to powder – an ancient Mayan cite. They then destroy the safety of Belize City by interfering with the police and having an incompetent Minister of Police. They then allow the destruction of our boarder and resources by not stopping to illegal gold mining and logging. They then destroy investor’s confidence. They now are destroying the fortitude of the student’s mind having to deal with this bureaucracy. They are destroying the self esteem of Belizeans and the Image of Belize. This UDP crowd has to go. O’ and they want to destroy our barrier reef by oil drilling… All industries were built by the PUP. The UPD only destroys and victimizes. Make Espat and Cordle Hyde you got to come back home- before they put you out to dry. UDP is destroying Belize, UDP is bad for Belize. City folks – a few pave streets can’t feed Belize, the cost of living is too high and crime is too high – don’t let them fool you with a few pave streets and cash around election time.